This entry was posted in Cancer Therapy Evaluation Program (CTEP), critique, critiques, critiqued, critiquing, Department of Cancer Treatment (DCT), Department of Health & Human Services (HHS), Gorski ScienceBlogs.com/Insolence ScienceBasedMedicine, Michael A. Friedman, M.D., National Cancer Institute (NCI), National Institutes of Health (NIH), Orphan Drug Designation (ODD), Stanislaw Rajmund Burzynski, The Skeptics and tagged ", "(not ordinary) chemotherapeutic drug", "12 FDA-supervised Phase II clinical trials have confirmed anti-tumor efficacy in several types of brain tumor", "12 FDA-supervised phase II clinical trials have confirmed anti-tumor efficacy in several types of brain tumors", "5. 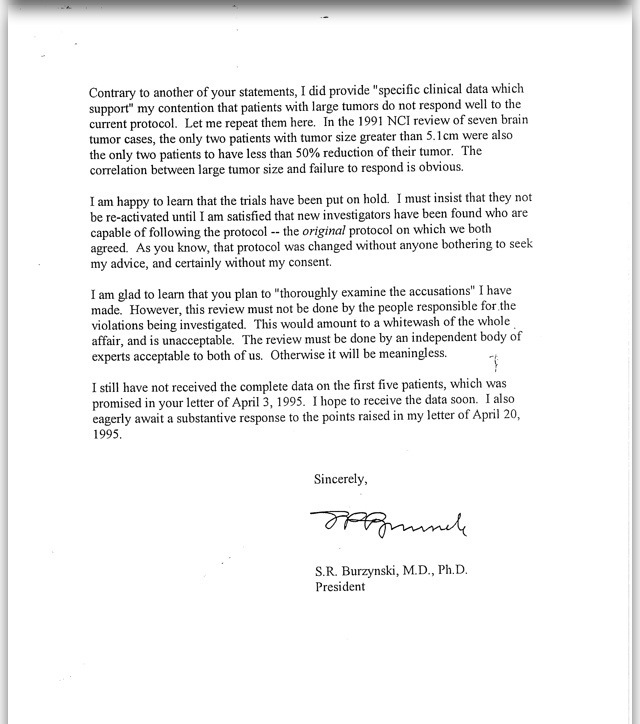 Acknowledgements This study was supported by and carried out at the Burzynski research Institute (BRI), "aconitase 2", "AKT pathway", "Another case of the failure of physician regulation endangering patients", "at an NCI-designated comprehensive cancer center", "Based on pathway analysis, "Bobby Blaskiewicz", "Burzynski. S.R. Antineoplastons. oncogenes and cancer", "Burzynski. S.R. ", "Burzynski’s personalized gene-targeted therapy", "Cancer care: Is the system “in crisis” ? ", "Cancer Therapy Evaluation Program (CTEP)", "caspase 5", "CDCs 25A 25B", "CDKs 1 and 2", "CDKs 3, "computer illiterate", "conducted a total human gene array screen using the Affymetrix Human Genome plus 2.0 oligonucleotide arrays, "Critiquing Dr David H. "Orac" Gorski, "Critiquing: Dr. David H. “Orac” Gorski and The Skeptics™ http://www.scienceblogs.com/Insolence, "Critiquing: Dr. Michael A. Friedman, "Critiquing: National Cancer Institute (NCI) at the National Institutes of Health (NIH) CancerNet fact sheet”, "Critiquing: Stanislaw Burzynski: On the arrogance of ignorance about cancer and targeted therapies", "cyclins A, "cyclins D3 and E", "Department of Health &Human Services (HHS)", "Dharmacon mRNA profiling array", "Dianthus Mediclueless", "Did Dr. Michael A. Friedman FIB ? ", "Division of Cancer Treatment (DCT)", "doi:10.4236/jct.2012.33028", "down-regulated", "Dr. Mario Sznol", "Dr. Michael A. Friedman", "expression of mRNA for vitamin D3 up-regulated protein 1 (VDUP1) was found to be over 100 fold higher for cells treated with PG and PN", "fumarate hydrogenase (FH)", "gene TXNIP was up-regulated almost 5-fold with PG, "General George S. Patton, "GOraCON”, "In 2004 the FDA granted orphan drug designation for antineoplastons A10 and AS2-1 for the treatment of brainstem glioma", "In fairness, "Journal of Cancer Therapy, "man-crush", "massive fact-checking #FAILS", "Mayo Clinic", "MCMs 2, "Memorial Sloan-Kettering Cancer Center", "mRNAs 125a-5p has recently been shown to be regulated by the epidermal growth factor receptor and to function as a tumor suppressor in lung cancer", "mRNAs 125a-5p", "National Institutes of Health (NIH)", "netrin receptor", "over-expression of mRNA 125a or mRNA 125b caused reduced migration and invasion of SKBR3 breast cancer cells", "Patil, "Patil S, "PB has dose-limiting neuro-cortical toxicity", "peptides isolated from blood and urine", "PG is not toxic to normal cells", "Phone It in again", "polykinase 1", "Published Online June 2012", "Regulatory Affairs Branch (RAB)", "Robert B. Lanman", "significantly up-regulated", "Skeptic Canary Show", "Sonali, "Stanislaw Burzynski: On the arrogance of ignorance about cancer and targeted therapies", "succinate dehydrogenase C (SDHC), "succinate-CoA ligase 1 and 2", "SUCLG1and 2", "The FDA granted Orphan Drug designation for Antineoplastons A10 and AS2-1 for the treatment of gliomas, "The Institute of Medicine report on cancer care: Is the system in crisis ? 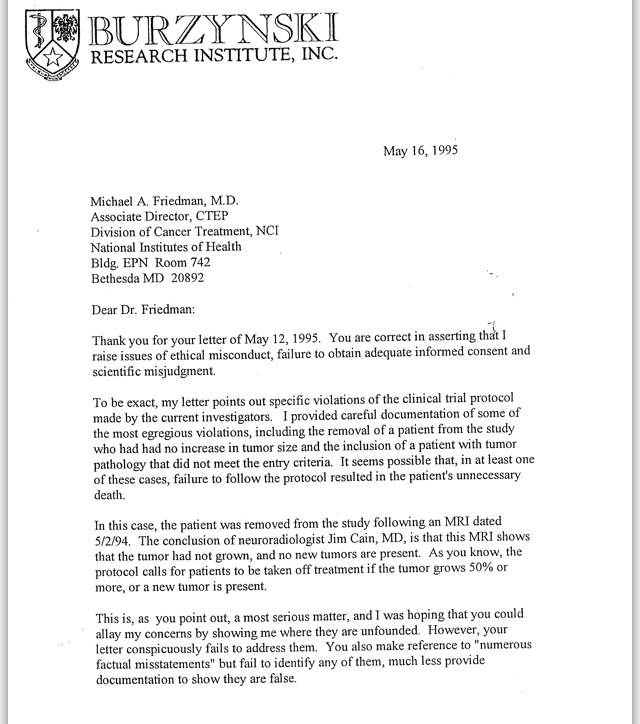 ", "The Institute of Medicine", "The Microarray assay was supported by BRI and carried out at Center for Functional Genomics, "the scientific rationale to expect that” antineoplastons “might have antitumor activity”, "Thermo Fisher Scientific", "total human microarray screen", "user hostile”, "Volume 10 Issue 5 October 2008", "Volume 10 Issue 6 December 2008", "Volume 12 Supplement 4 November 2010", "Volume 14 Supplement 3 September 2012", "Volume 5 Issue 4 October 2003", "Volume 9 Issue 4 October 2007", "Waldbillig R, "Wayne State University", 125a-3p, 192-200", 1944", 2012, 3, 4, 5, 6, @gorskon, a most serious matter, ACO2, Adam Jacobs, Affymetrix, Affymetrix Human Genome", AKT2, and 6", and 7", and almost 120-fold using a combination of PG and PN", and B2", and gene array studies on the antineoplastic agent phenylacetylglutamine (PG) in human glioma cells U-87. Neuro-Oncology. 2003; 5: 309", and I was hoping that you could allay my concerns by showing me where they are unfounded“, and the All-American football players”, as you point out, ASPM, Associate Director, ATF3, “All real Americans love the sting and clash of battle…When you, “Americans love a winner”, “Americans love to fight, “Americans will not tolerate a loser”, “antineoplastons” "ability to inhibit the growth of cancer)”, “has managed to keep practicing for 36 years", “However, “I also eagerly await a substantiative response to the points raised in my letter of 4/20/1995", “I am glad that you plan to thoroughly examine the accusations I have made”, “I do know cancer science”, “I’ve searched Burzynski’s publications", “Personally, “This is, “which genes are targeted by antineoplastons“, “You also make reference to numerous factual misstatements but fail to identify any of them, B1, BUB1, Burzynski, Burzynski SR, Burzynski SR. Mechanism of action, CASP5, cause cell cycle blockade and Apoptosis in U87 Glioblastoma cells. Journal of Cancer Therapy 2012;3:192-200" "Patil, CD38, CDC20, CDC6, CDC7, CDCA8, Chittur, CLDND1, DATA, Davey James", Detroit, Dr. David H. Gorski, E., Emilia Mrowczynski, epitome, everyone of you, FACS is NOT doing something wrong when he LIES about Burzynski:", for genes regulated by PG and a combination of PG and PN", GADD45A, Genes, geniusless, Grela, Grela K. Targeting MicroRNAs in Glioma Cells with Antineoplastons. Neuro-Oncology 2010; 12, Guy, having pored over Burzynski’s publications", here, Houston TX, http://scienceblogs.com/insolence/2012/11/02/stanislaw-burzynski-fails-to-save-another-patient/, http://scienceblogs.com/insolence/2013/05/08/eric-merola-and-stanislaw-burzynskis-secret-weapon-against-the-skeptics-fabio-lanzoni-part-2/, http://scienceblogs.com/insolence/2013/06/05/odds-and-ends-about-burzynski-clinic/, http://scienceblogs.com/insolence/2013/09/19/another-case-of-the-failure-of-physician-regulation-endangering-patients/, http://scienceblogs.com/insolence/2013/09/19/the-institute-of-medicine-report-on-cancer-care-is-the-system-in-crisis/, http://www.burzynskiclinic.com/images/stories/Publications/5169.pdf, http://www.burzynskiclinic.com/images/stories/Publications/7854.pdf, http://www.burzynskiclinic.com/images/stories/Publications/7897.pdf, http://www.burzynskiclinic.com/images/stories/Publications/8636.pdf, http://www.burzynskiclinic.com/images/stories/Publications/9219.pdf, http://www.burzynskiclinic.com/images/stories/Publications/9291.pdf, http://www.burzynskiclinic.com/images/stories/Publications/971.pdf, http://www.burzynskiclinic.com/scientific-publications.html, https://stanislawrajmundburzynski.wordpress.com/2013/07/26/x/, https://stanislawrajmundburzynski.wordpress.com/2013/08/07/critiquing-dr-david-h-orac-gorski-m-d-ph-d-l-i-a-r/, https://stanislawrajmundburzynski.wordpress.com/2013/08/08/critiquing-dr-david-h-orac-gorski-and-the-skeptics/, https://stanislawrajmundburzynski.wordpress.com/2013/08/27/wayne-state-university-detroit-michigan-quickly-realized-that-david-h-gorski-md-phd-facs-is-not-doing-something-wrong-when-he-lies-about-burz, https://stanislawrajmundburzynski.wordpress.com/2013/09/08/critiquing-stanislaw-burzynski-on-the-arrogance-of-ignorance-about-cancer-and-targeted-therapies/, https://stanislawrajmundburzynski.wordpress.com/2013/09/18/did-dr-michael-a-friedman-fib/, https://stanislawrajmundburzynski.wordpress.com/2013/09/19/critiquing-national-cancer-institute-nci-at-the-national-institutes-of-health-nih-cancernet/, https://stanislawrajmundburzynski.wordpress.com/2013/09/19/dr-michael-a-friedman-data/, I will point out that he hasn’t put the time in to learn all the ins and outs of the system", in 2009", Interventist, it was observed that anti-neoplastons affected the expression of more than 40 genes instrumental in the cell cycle in GBM cells", iv10", Jr., June.5, K. Antineoplaston AS2-1 affects cell cycle checkpoints, K. P.003. Phenylacetylglutaminate in combination with Phenylbutyrate effectively inhibits growth of brain tumor cell In Vitro. Neuro-Oncology 2012;14(Suppl. 3):iii16", K. Phenylacetylglutamine (PG) and phenylacetate (PN) interact additively to produce detachment-induced apoptosis/anoikis in glioblastoma cells. Neuro-Oncology 2007; 9:482", K. The ingredients of antineoplaston AS2-1 down-regulate glycolysis pathways in glioblastoma cells. Neuro-Oncology 2008; 10:1148", Krzysztof Grela, L.I.A.R. ", leading to apoptosis in human glioblastoma cells. Neuro-Oncology 2008; 10:786", M.D. ", MAD2L1, MD", Michigan, Mrowczynski, Mrowczynski E, much less provide documentation to show they are false”, mystified, National Cancer Center (NCI) at the National Institutes of Health (NIH), National Cancer Institute (NCI), NY, OASL, Orac, ORC1L, p21, p21/CDKN1A, p53, Ph.D, PHASE 2 TRIAL, phase II clinical trials, PhD, pontidefecates, PPM1A, Public Health Service", Quality Assurance and Compliance Section, quickly realized that David H. Gorski, S. Patil, S.", S.R. ", Sridar V. Chittur. Phenylacetylglutaminate and Phenylacetate in combination Upregulate VDUP1, Stanislaw Burzynski, Stanislaw R. Burzynski, TCF8, the big league ball players, the fastest runner, the toughest boxer, TP53, traditionally”, TRB3, TRIB3, twerkpidity, unapproved, UNC5B, University of Albany, uptake, USA, were kids, you all admired the champion marble player, your letter conspicuously fails to address them“ by didymusjudasthomas. Bookmark the permalink.